HOT DEALS: Richer Sounds offers speaker deals on new Denon kit | What Hi-Fi? Buy the D-M38 micro system (£229.95), the replacement for the Award-winning D-M37, and VIP customers qualify for £50 off any pair of speakers to go with it. And if you go for the 3D-ready Denon AVR-1911 multichannel receiver (£449.95), VIP customers can get any 5.1 speaker package at a discount of £100. Alternatively you can get an Onkyo HT-S3305 home cinema package with 5.1 receiver and full set of surround speakers for £299.95. TV deals include a Philips 42PFL5604 LCD for £399.95 (saving £200), or an LG 50PK350 Full HD plasma for £599.95 (save £100). Check out the Richer Sounds website for more offers. 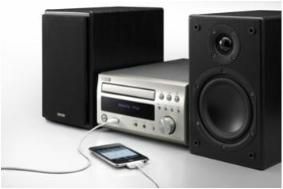 And you can win an Onkyo HT-S3305 in our competition.